This is the third and final post for Babies Awareness Week. 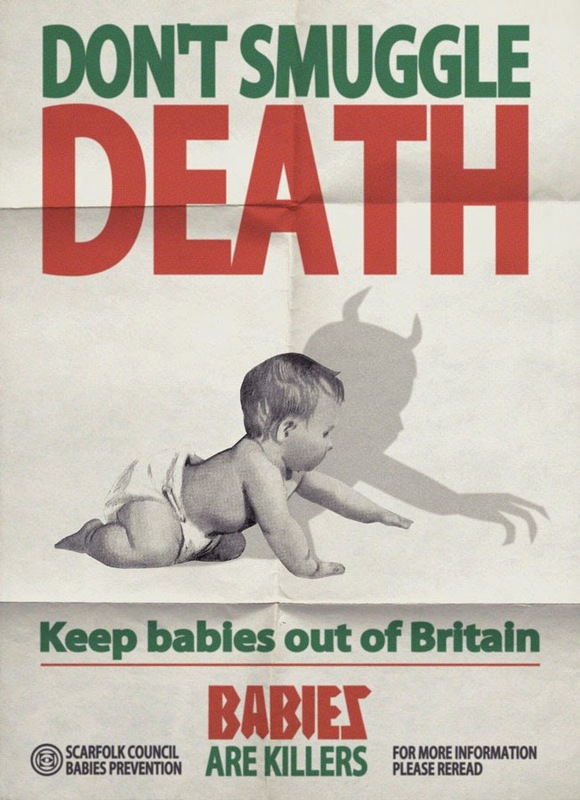 We hope that the danger of Babies has now been fully conveyed to you. Remember that the symptoms of Babies are not always visible. If you have been been bitten by a baby, toddler or even an adult under 4 feet 9 inches, always visit your doctor. If you do not receive medical attention within 74 years of being infected you risk suffering from the effects of aging and, ultimately, death. "Don't smuggle death. 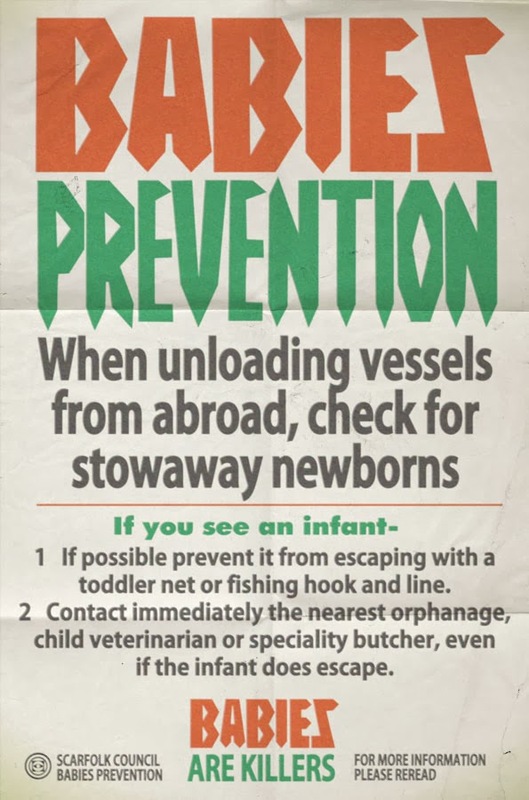 It could save your life..."
Babies Awareness Week continues with this poster which was placed in airports, harbours, maternity units and other entry points into the United Kingdom. Today is the start of Babies Awareness Week in Scarfolk, so make sure you check back for updates. The first Babies Awareness Week took place in 1973 after health and literacy clashed with wide-reaching consequences. 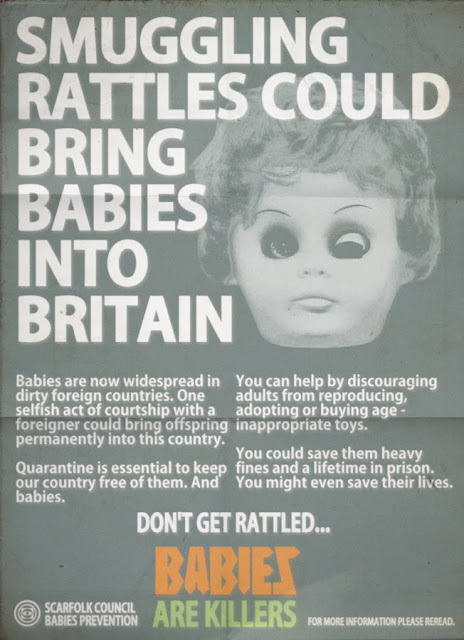 Here is an excerpt from a 1974 leaflet: "While babies are stunted, mostly inefficient humans, 'Babies' is the name of a viral disease carried by unbaptised infants born out of wedlock. It is usually transmitted to other animals by a bite from an infected baby. 'Babies' travels via the nervous system through the anxious gland to the brain, which is most often stored within easy reach of the cranium. The virus is untreatable and invariably fatal within days, especially if panicking family members leave the delirious patient to stumble aimlessly along the motorway at night. Early stage symptoms include gurgling, inability to walk or solve complex mathematical problems, an inexplicable contempt for mashed banana, and defecating without panache accompanied by a sense of unjustified triumph." Back in the 1970s, concerned parents vaccinated their children daily and those suspected of having contracted 'Babies' were taken away by the council in large trucks then pickled, varnished and used as clothes mannequins in department stores. However, this practice was stopped when the virus spread to a range of medium-priced sweaters. It was the first time that the disease had passed from one species to another.